Keep an up to date list of Agencies talent is placed with in their Profile. This list in turn will help you create Mother Agency Invoices for when these are due to you and also help you create Mother Agency Bills for what you owe to Mother Agencies. Go into the Talent Profile and click on the Agencies tab. Click Add Agency to add a new Agency. A pop up window will open for you to fill out. 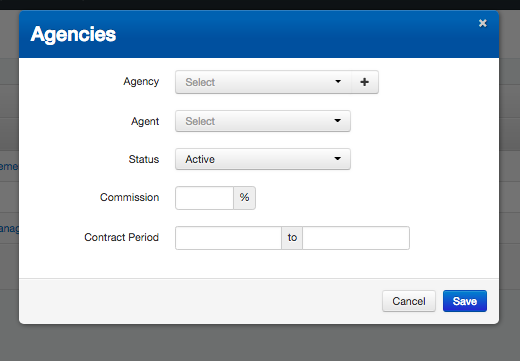 Using the drop down arrow you are able to select an Agency from your existing Contacts list, or add in a new contact Agency by clicking on the plus icon. Selecting an Agent at this Agency is not a mandatory field. Status enables you to mark whether the placement is currently Active or whether in fact this is the talent's Mother Agency. If you select Mother Agency, then when you go to create and view Mother Agency bills for this agency, the Bookings from this talent will populate. (You can also keep a list here of agencies you have introduced this talent to but who haven chosen not to represent them). It is also important to make sure the Commissions field is filled out to make sure the commissions are calculated correctly. One you have filled out what you can, click Save. A list of all the Agencies your talent is placed with and the current status of this placement will appear in the Agencies tab. Now that you have added an Agency to your talent, if you go into the Contact details for this Agency, two new tabs will appear in their details section: Talent and Mother Agency Invoices. Use this list to keep track of the talent and to create Mother Agency Invoices due to you. 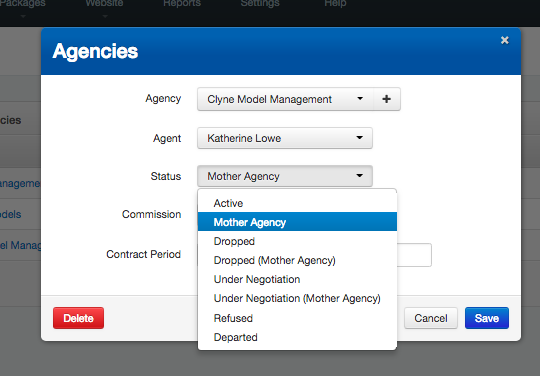 Secondly, if you have access to Reports you are now able to create Mother Agency Commission Statements (Bills) for what you owe the Mother Agency.